Click on a session to show the schedule for that particular session. Learn CALL basics from experts and enhance your teaching with digital resources. This event includes hands-on guided practice in the Electronic Village on a variety of introductory CALL techniques and tools. This presentation is about K-12 ELL teacher candidates’ social construction of professionalism using a blog. The teacher candidates were empowered to re-envision their participation as interdiscursive when analysis of their blog usage was shown. Audience will read sample blog postings and learn how these teachers socialize professionally digitally. Having implemented digital reflective journals in professional development (PD) courses for EFL teachers, we propose a new approach for evaluating knowledge gained during training. The phenomenon of ‘reflection dialogue’ is proposed and its implications on PD in the digital era will be drawn in this presentation. Padlet is a free online virtual bulletin board that can improve student engagement and academic achievement. In this session, participants will be introduced to several creative Padlet activities that can be used in a variety of ESL classrooms to foster language development, enhance student collaboration, and encourage reflection. Unimersiv is a virtual reality application that encourages students to learn in a real-world simulation. The realistic and stimulating context encourages student motivation and provides opportunity for more integrated teaching. This session will show how Unimersiv can be used in five ways to complement ESL lessons. The presentation discusses pros and cons of different web-based reference tools, EndNote, RefWorks, Mendeley, Zotero, etc. and give teachers tips for teaching student writers how to use them. Student perception and satisfaction levels with the tools will also be examined to help teachers choose a right tool for their students. The presenter will discuss some of the indicators that teachers need to consider when selecting podcast programs for their students guided by previous empirical research on the factors that can influence students’ listening comprehension, e.g., length of the listening passage, speed, number of topics, gender, vocabulary, and syntax. E-portfolio is believed effective as students can reflect on their learning and observe their development in a systematic and accessible way. The presentation is a step-by-step guide on how to design and use Weebly, an online platform for blog and storage, as a tool for e-portfolio in an EFL class. The presentation aims to demonstrate the use of virtual reality (VR) headsets in English language education. VR devices such as Google Cardboard and Samsung Gear VR have multiple software applications that develop English language skills. 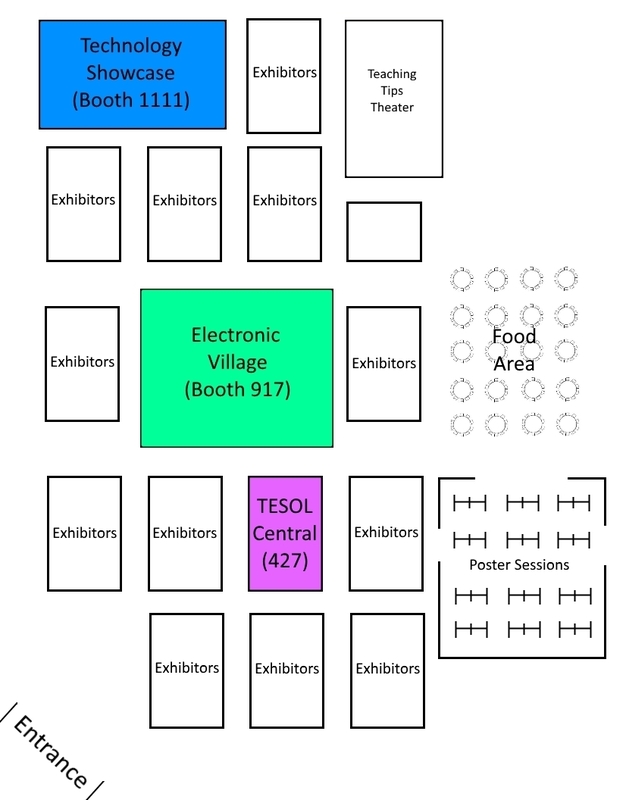 Attendees will learn how to utilize VR headsets in ESOL classrooms and beyond ESOL classrooms. The presentation demonstrates how to use the device called Makey Makey to create projects in which students can create their own inventions and combine them with the internet. By doing this, students will have the opportunity to enjoy project-based learning with a technological touch. The presentation provides participants with an overview of the scope and sequence of select Duolingo English courses as well as a demonstration of how students would interact with the curriculum content. The session covers key elements to building an online portfolio for teachers and teacher educators who are interested in showcasing skills, development, assessment, or reflection. Using ESL/EFL practitioner samples from WordPress, Google Sites, and Wix, the session provides guidance to getting started with multimedia content curation for online teaching portfolios. Digital storytelling is a powerful motivator. When combined with the unique design of the Pecha Kucha (Japanese for “chit chat”) format, students develop creative and concise presentations while developing oral fluency through meaningful practice. Come push the boundaries of traditional presentations using a free online resource. Suitable for all levels. Cloud Computing in School: Teachers' Feelings of Comfort Integrating Google Suite for Education. Cloud-computing is believed as a significant type of education technology which powerfully enhances collaboration in learning and teaching. In this presentation, I will share my research about how the secondary public-school teachers confront the mass integration of cloud computing services (Google Suite for Education in particular) in school settings. This study explored how playing a video game, Pokémon Go, can help motivate ESL students to engage in online writing spaces. I present results from a study conducted in an academic ESL course and offer suggestions for practical application of games in language classroom instruction. Computational thinking (CT) is an essential skill for full participation in today’s society. Yet there has been little discussion about the teaching of CT to language learners. In this talk, I explore how an elementary CT curriculum supports multilingual students’ development of CT, literacy, and positive attitudes towards computer science. This presentation will show attendees project and activity ideas that use Google Drive tools in new and innovative ways, such as student-created infographics and adaptations of table top games with Google Drawings and Documents. Students practice their language skills through development, presentation, and use of both individual and group projects. You do not have to be a designer to create professionally-looking English teaching materials. In this presentation you will learn how to use PowerPoint to design eye-catching layouts. The session discusses the basic principles of effective materials design and explains how to realize these by using the PowerPoint toolkit. This presentation demonstrates how students can use WordPress to create multimedia digital narratives based on their own experiences. Presenters will share how digital storytelling allows multilingual students to become the expert, to connect their experiences to a broader world, and to connect with domestic students in a meaningful way. This session demonstrates using Microsoft Word’s document merge feature to visually draw awareness to differences between an original text and an attempted paraphrase or between drafts of an essay. Classroom activities are also provided to use this tool for revision and paraphrasing strategies as well as avoiding plagiarism. PC 2 Capitalize on Free Resources at Your Fingertips! You wouldn’t believe how much happier you will be when you save 0.3 seconds using a short cut instead of clicking tool bar buttons. In this session, participants will engage with common functions, free tools, tips and tricks in the Windows environment that will help them save those precious milliseconds. Participants will learn about the Digital Leadership Portfolio, a three-year project allowing students to build digital literacy and leadership skills using a variety of internet platforms to document their reading, writing, and speaking. The format incorporates the Leader In Me framework, helping students reflect on their social/emotional development. Mind mapping is a beneficial technique for helping students organize concepts. The research on interactive online mind mapping applications suggests that students’ performance with online applications outperform paper-based mind strategies. In this presentation, the attendees will learn how these applications can benefit students in overcoming learning and retention issues. Teaching research writing is a difficult process. Building class wikis allows students to collaborate on the research process, maximizing class time. We demonstrate how to create wikis and how to involve students in creating research-focused materials to post on the class wiki for use in the writing process. Textbooks are never without their problems. Finding the right one is nearly impossible. The solution may be to write one. This technology fair shows you how to get started with Microsoft's Sway to create a customized, flexible digital textbook that incorporates student input and meets student needs. This workshop demonstrates how to use Twine, an open-source tool for creating interactive stories and short text adventure style stories. Keep your students engaged with reading passages that will take them on a visual journey. Participants will learn the basics of Twine and leave with a functioning interactive short story. Want to create attention-grabbing visuals to support face-to-face or online courses? Interested in tools that enable ELLs to develop multiliteracy skills through motivating activities like infographic and digital poster creation? Join us for hands-on exploration of an open-source design platform and image curation sites that can jazz up your instruction! While CALL, Computer-Assisted Language Learning, provides the access portal for online learning, SMALL furnishes the language learning experience with research-based benefits and learning outcomes that engage and motivate students through discussions and interactions in familiar social settings. Panelists present ways social media Assists language learning, success stories, and SMALL's impact. A Choose Your Own Adventure style advising session simulation was created from 50 advising session role-plays with international students. The software implements a variety of feedback types to promote pragmatic noticing. The talk will focus on how simulations can be used for providing pragmatic feedback to learners. The free, teacher-created website "American English Sounds" reduces classroom instruction time by allowing students to independently practice the segments they need to improve through listening, repetition, and meaningful speaking activities. Come learn how you can use “American English Sounds” in conjunction with both classroom instruction and independent learning. Making quizzes more secure: Making the Moodle Reader Plug-in draw quizzes from the MReader database. After demonstrating these free quiz programs for Extensive Reading, the presenters will describe how the Moodle Reader module and MReader have been integrated so that all quizzes are now served to students via a single secure database. The implications will be addressed. LiveCode is well suited for playing and recording audio files – important capabilities in creating materials for learning and teaching languages. The tutorial, created in LiveCode itself, includes instructions as well as real-time demonstrations for each function. This tool is available as a free download. Harnessing the ocean of authentic material on popular video sites means finding a way to integrate videos into a class. PlayPosit offers a seamless means to splice videos with interactive assessment tasks while monitoring progress and providing meaningful feedback. Come learn how to use this free website in your class. wordpress.com is a content management system which is famous among bloggers around the world. It is extremely user-friendly, secure, and fast. wordpress.com is a great platform for writers and bloggers with community information. Users can create accounts, post blog entries, create dynamic pages and share on social media from it. As the use of video becomes commonplace in the classroom and beyond, the frustration of unclear communication can be reduced with the skill of knowing how to self-caption multimedia content. Reading, writing, listening and speaking skills can all be strengthened through script and video creation in digital environments. Mac 4 Quiz Shows in the Classroom? Ding, Ding, Ding! With so many options for using quiz-show-like games such as Kahoot, which one is most effective for your students? Come to this presentation to learn about options such as A) Blended Play, B) Quizalize, C) Socrative, or D) all of the above and more. Mac 5 Flipping for FlipGrid: Where Social Learning Happens! Flipgrid is a FREE video discussion platform with easy-to-use recording tools that leverage student common underlying proficiencies with social media. Students say, “it’s like Snapchat, but for homework.” Come learn more about how you can use Flipgrid to incorporate authentic listening and speaking tasks into any curriculum. AutoCrat is a free Google Sheets add-on that uses spreadsheet data to generate documents and emails. We will share how we used it to collect peer-feedback and send students their own personalized progress reports. We will consider the learning curve involved and brainstorm other uses of this time-saving tool. PC 2 Trace Effects: What Makes It Suitable for English Language Classrooms? The implementation of video games in the classroom can be an effective means to improve language competence. Based on the analysis of Trace Effects, attendees will be provided with the tools to identify what specific characteristics and parameters make this and other videogames helpful in the English language classroom. Want a more secure way to manage your cloud storage, file sharing, and collaboration needs, particularly for portfolios? Welcome to Box! Come see how to use it for you and your students to keep files organized, sharable, and secure, as well as allowing for real-time collaboration. PlayPosit provides an avenue for building student agency as the student becomes the “teacher”, choosing and controlling the lecture, in this highly interactive video platform. Presenters offer examples and lesson ideas for using this creative and interactive online tool with ITAs and Adult Education and suggestions for other ELLs. Websites can be easy and free to create with Weebly. Learn how to build a website for your learners to access both in and out of class. Sites can include blogs, embedded videos, document uploads, and more! Use your website to foster discussion, flip your classrrom, or provide self-access activities. Come to the Electronic Village during this time to ask CALL experts questions and try out CALL resources! In this session, presenters will discuss how to better get to know English learners by using technology, how to utilize technology to create ideal English learning environments, how to use digital means to differentiate instruction to various learner needs, how to assess English learners using technology, and how to use technology to create a community of practice among English teachers. Participants will receive examples and a number of tools that can be implemented in ESL, EFL, and ELT contexts. Memrise is an ideal platform for guided autonomous vocabulary learning. It provides students with a free, efficient tool to gain accuracy, confidence, and purpose. In this workshop, participants will analyze texts and tasks for different skills, create sets using best practices, resolve common issues, and discuss integration, monitoring, and assessment. Kahoot!, a gaming tool for assessment and collaborative learning, supports sound teaching methods and engages today’s students desiring highly dynamic learning environments. Through guided practice, participants will unpack, analyze, and practice Kahoot’s multi-functionalities to engage students in becoming agents in constructing their own learning. The CALL-IS Open Meeting is the annual business meeting for the purposes of conducting business and disseminating information. All active CALL-IS members are invited to come and vote for the nominees to the CALL-IS Steering Committee. Young English learners learn vocabulary, language, and story schema with traditional picture books introduced in their English language classroom. The e-book storybook can also be an effective way to developing language and introduce new vocabulary for this learner. The presenter describes selection criteria, with example e-books that meet the criteria. The presenter will introduce the online version of a newly developed vocabulary depth test. This test measures several common yet problematic aspects of vocabulary knowledge for words on the New General Service List. The test's usefulness for English language learners and instructors will be demonstarted. Providing online language learning is an opportunity sought by most educators. However, finding a suite of tools integrated into a single platform that makes that possible is hard. Google classroom is such a platform. This mini-workshop will guide participants through setting up a classroom in Google and harness its potential. Augmented reality (AR) games have been shown to have many uses and benefits for language learning, but it can be difficult to learn how to use the software. This workshop will show teachers how to use the software to create an AR game for their own classes. The draw of Open Educational Resources (OER) is impossible to resist in the age of diminishing budgets and the increasing digitization of knowledge. This panel will explore the pros and cons of OER in K-12 education, including implementation of OER products, training teachers how to use OER effectively, and protecting student personally identifiable information. Furthermore, K-12 teachers will demonstrate key OER products they implement in instruction and collaboration. The session will conclude with a question and answer session to over any further topics or issues of interest to the audience. Turnitin can be used to give students effective writing feedback for revisions. The presenters will demonstrate how to use Turnitin to create a rubric, highlight writing errors, and identify types of errors. This presenter will share an extensive writing activity for an ESL course. In this activity, students use fanfiction.net to publish their creative writing based on their favorite literature, TV, movies, or games. The participants will learn about potential benefits and alternative adaptations of the activity. Many teachers incorporate multimodal assignments, but multimodal feedback is less common. The presenters demonstrate tools to create multimodal feedback, share example feedback on writing and pronunciation assignments, and summarize student response. Challenges and benefits of multimodal feedback are discussed, and participants are encouraged to experiment in their own classes. The presenter will share effective and engaging ways of using the mobile app Marco Polo in an ESL classroom to strengthen students’ speaking and listening skills. Participants will learn how to use this tool to engage students in ongoing oral discussions outside or class. Significant Objects is a project where writers bring meaning to objects by writing stories about them. In this presentation, we share a series of activities developed from the Significant Objects website so teachers gain an understanding of it and learn innovative ways of incorporating it into their classrooms. The presentation introduces the use of Plickers, a free assessment-platform, as a tool to carry out communicative proficiency and achievement activities. Participants will go through a short step-by-step description of the software and experience a couple of communicative activities using the software. Poll Everywhere is a free Web 2.0 service that enables classroom-clicker functionality via smartphone. The presenter will share tips for low-prep, high-reward usage and demonstrate several Poll-Everywhere-enhanced class activities, including the new Competitions feature. Looking for a way to increase student engagement through culture? Look no further than the Google Doodle. Attendees will learn three ways to use Google Doodles in their language classrooms and be inspired on ways to adapt Doodles to their own specific teaching contexts. This presentation demonstrates how to use a free online program for empowering students to learn and communicate about their world in a creative, interactive and personalized way. Participants will gain ideas on how to utilize Google Tour Builder for content-based collaborative learning projects that put student stories on the map. Collaborative online annotation tools allow teachers to scaffold for readers and foster student-to-student literacy support in multi-level reading classes. This demonstration will show how teachers can use the free Hypothesis plugin to provide customized support, check student comprehension, and enable students to annotate texts and interact with fellow readers online. Anxiety can lead to silence in the language classroom. Break that silence by using Peardeck, a hybrid presentation/polling application. Find out how students can share ideas anonymously while giving teachers important feedback. Bring your laptop or mobile device and learn how to create a more dynamic classroom using Peardeck. Instructors will leave with many tips and tricks of how to quickly create content in infographics for the benefit of scaffolding, how to flip the classroom, what to use for training videos, ideas for game based learning instead of using gamification in the classroom among other instructional design ideas. This session is led by Electronic Village Online (EVO) Coordinators and EVO session moderators who will highlight outstanding sessions from this year's EVO. Every year, for five weeks in January-February, participants and ESOL experts engage in collaborative, online discussion or hands-on virtual workshops of professional and scholarly benefit. The MET Museum’s website has inspiring resources that can easily be adapted to various levels and classrooms. Participants will explore this website, gain access to six activities that engage the four skills and encourage the language/culture connection and discover ways of integrating the MET in their own contexts. Presenters will describe how they used Flipgrid, a video response platform to increase oral fluency through authentic, moderated interactions, and prepare for and follow-up a cross-cultural exchange between language learners at an IEP and 8th graders. Presenters have step-by-step handouts for those who wish to undertake this project. This presentation will demonstrate how teachers can use Telegram bots to help students learn English. The attendees will learn how Telegram bots can help study lexis, grammar, and manage reading, listening and writing, as well as compete unit, progress and placement tests. In this workshop, the presenters will demonstrate hands-on activities and tasks for effectively using online dictionaries for ESL/EFL literacy development. The presenters will share three guidelines: direct instruction, translingual support, and integrative teaching. Participants will leave this session with resources, research, and inspiration to use online dictionaries in CALL. Does conceptualizing how daily lessons fit within the overall arc of your course seem challenging? Would it be helpful to visually see how day to day lessons scaffold towards mastery of learning outcomes? Using Prezi Next’s zooming feature, presenter will demonstrate how to plan daily lessons with big picture clarity. The aim of this presentation is to demonstrate how to use the platform to arrange blended classes for adult learners with different level of English. We will share our curriculum based on individual approach to each student, demonstrate online interactive tools and techniques used and give some didactic insights. In this presentation, the author will share her own experience and demonstrate how to exploit a free teaching resource and useful tools on website named Apps4efl to improve students’ communicative, collaborative, creative abilities. PC 4 Building social outreach in Colombia’s Coffee Region through the use of Edmodo. Edmodo has helped our community enrich their L2 learning, reaching out to people that hadn’t found the way to formally study English before. Key aspects were the curriculum flexibility, a concrete professional development program and the adoption of Edmodo. Hence, participants will be inspired beyond the simple use of Edmodo. Attendees will learn how they can use a new, interactive classroom technology that allows the teachers to select or input readings that have text-to-speech capabilities and accompanying activities and flashcards that are also supported with text-to-speech. The content is fed into handheld devices and can also be accessed online. This presentation demonstrates the use of Flipgrid, a tool for making video recordings, to promote learning interaction and feedback, in an EFL context to promote more students voice. A series of ideas to create active learning and interaction and to integrate four skills in English classes with Flipgrid are presented. This presentation demonstrates how to utilize video streaming services (Netflix, Hulu) in an Intensive ESL course . Participants will learn how to encourage and effectively assess authentic spontaneous productions of speech and writing of students in response to video content. Responses occur in real-time via social media (Twitter, online SNS). The presenters discuss the implementation of games in EFL classrooms. They use a Digital game called Kahoot. It improves students’ grammar and vocabulary learning. The teachers utilize Kahoot as warm up, revision, homework, and assessment tools in classrooms. The attendees will learn how to use this game for different purposes. Learn how to create 360 photos and how to use them with students in the classroom. We will take some photos and learn tips and tricks. Next we will use Google Tour creator to create virtual tours to bring back to our classrooms. This presentation will teach attendees to guide student essay planning using the free application Mindmup. Participants will create a web-based, interactive graphic organizer for their students and explore sharing and commenting features that allow teachers to provide detailed interactive feedback throughout the planning process. You’re a K-12 teacher. Your EL needs to learn academic vocabulary fast. We have an app for that. Based on corpora representing 10 million textbook words, we assembled VIRS, which promotes color-coding toward focus on vital vocabulary. Presenters demonstrate the app with respect to lesson planning, readability, and vocabulary size. In an EFL context it’s often hard to encourage students to extend their language learning beyond the classroom. WeChat is a common messaging system available in China. This presentation will go over different activities that can be conducted using this app. This presentation is about making intonation of the English language more visual, tangible and fun through the use of free apps like: Voice Memos (iPhone), Clear Record, Recorder, TW Recorder, and Make Staff which help raise learners' awareness to the frequency of pitch variation on a graphic. Game-based learning is a fun and engaging way for students to learn through experience! Introducing two videogames from iCivics: Do I Have A Right? and Immigration Nation! Both feature digital scaffolds and tips for teachers to help EL students navigate the complex academic vocabulary of civics. Also available in Spanish! The Bitmoji app (a personalized avatar set builder) is excellent for beginning-level language learners as it provides authentic material around the thematic content of body parts, clothing, emotions, and overall appearance. The presenter will demonstrate use of this free IOS/Android app with recommendations for lessons, projects, and formative assessment. Quizlet has a new line of stories that go beyond vocabulary lists. Students begin with an illustration which is read to them in the target language. The card can be flipped for translation. The students progress through different levels, ending at the last level where they tell the story independently. Flipping for FlipGrid: It’s Like SnapChat, But for Homework! Busuu is a lively app that allows students to work through bite-sized lessons that are high in quality. Presenters demonstrate that this is a great tool for emergent learners, students with mid-level fossilized skills, and those who struggle with independent studying. Busuu helps teachers launch richer lesson plans! After teaching a lesson on Thesis Statements, the instructor observed some weaknesses among his students. So as a sort of review/doubt-clearing activity, he developed a Kahoot! game suited for his students' needs. Students found it to be engaging, fun and a very positive learning experience where collaborative learning took place. This presentation will demonstrate the features of the State Department’s free 3D Video game Trace Effects. The presentation will also detail how Trace has been used over the last year in the Dominican Republic and Panama to incorporate technology into the curricula and promote STEM for younger learners. This demonstration explores online speaking tools, to encourage students to interact and participate in the ESOL Classroom. These hands on learning tools facilitate ESOL students' language learning by stimulating creativity, communication, critical thinking and comprehension. Voicethread, Seesaw,Storyboardthat, Padet and Quizlet.Live will be discussed. This presentation will orient you on how to create four types of listening activities that help develop listening skills in language learners by using websites that offer authentic listening materials. MReader is a free online app Extensive Reading programs. It allows teachers (and students) to verify that they have read and understood their reading via a simple 10-item randomaized quiz. Students who pass a quiz receive the cover of the book on their own home page on the site. In this session, the presenter demonstrates five different Web-based services or mobile apps that can help teachers manage their classrooms better, assess language skills more effectively, and engage students more actively. The presenter explains how these tools can be blended together to achieve the objectives of any language class. The researcher used information processing theory, specifically encoding and retrieval phases, as a strategy to enhance pre-post student-teachers' learning and understanding of learning theory application in the classroom. Combining use of senses and projecting main learning theories in classroom processes, 25 participants created short films using Windows Movie Maker. In this presentation, you will learn about an innovative video project in which intermediate ESL students produced 10-15 minute infomercials they filmed on smart phones and edited online. Participants in this demonstration will receive a handout which includes a sample assignment and grading rubrics and view several student-produced infomercials. Teachers can design quizzes and tests for all skills by using google forms and the quiz add-on, Flubaroo. The presenter will demonstrate how easy it is to do formative assessments with Flubaroo which grades the test immediately and analyzes the exam questions and the student results. This presentation demonstrates how collaborative writing through Google Docs was used in higher-ed ESL courses to promote student engagement and improve students’ writing skills. The presenters will provide step-by-step guidance and practical tips for incorporating collaborative writing into various levels of ESL writing courses. Mac 1 Online Discussion Boards: Great Tools for Teaching US Culture through Movies to ESL Learners! The main purpose of this presentation is to discuss some benefits of online discussion board such as, critical analysis, self-reflective process, intercultural literacy, and peer assisted learning; which presenter has implemented in her US Culture through Movies class. The presenter will also share some student samples of discussion board posts. Actively Learn is a free digital reading tool where students can work interactively throughout the reading process. This presentation will demonstrate how we have used Actively Learn in the ELL classroom and guide teachers through its features, creating a reading task, and integrating it in their own classrooms. Creating videos for students and fellow instructors can be done effortlessly through Kaltura CaptureSpace. Kaltura CaptureSpace allows teachers to easily put together and edit videos for multiple uses, such as instructional videos to supplement class materials or teacher development videos to demonstrate a teaching tip to other instructors. The presentation demonstrates how teachers can employ Quizlet games to improve students’ vocabulary learning. It is a challenge for learners to master spellings, pronunciations, and meanings of the medical terms. The presenter will share the proper strategy to overcome such a challenge in a fun and motivating way. SpeechAce, a pay-for pronunciation program, can enable students to self-correct their pronunciation errors in the privacy of their own rooms. This presentation demonstrates how to use SpeechAce, what some possible pedagogical and technological issues of using it might be, and how it was received by a group of students. This session demonstrates the process of creating digital storytelling in an EAP speaking class to present a persuasive argument regarding international immigration using Google Docs and Windows Movie Maker. The implementation of the CALL tools will be demonstrated in this session, which can be adapted to various language teaching contexts. "You have been selected for the Pronunciation Olympics!" Students compete with their classmates on the pronunciation of increasingly tricky contrasts of consonants, vowels, and stress. Voice recognition technology (via Google Docs) provides instant, objective feedback that inspires engaging articulatory practice. Let the games begin in your class! Student can gain first-hand experience in genre, audience, and style by transforming academic writing into social media posts. Each platform has its own genre conventions, audience profile and expectations, and style conventions, especially for professionals. Participants will get creative ideas for moving researched writing beyond the classroom. The concept of Project-Based Learning (PBL) is applied in a project where students develop a rental guide for foreigners who visit or move to their country. The project helps students reflect on their culture, develops the four skills, as well as the three modes of communication with a real-world purpose. This presentation demonstrates how Canvas, a learning management system, is utilized to implement a seven-week asynchronous online training of English Speaking Consultants prior to their practicum. Attendees will see examples of instructional materials in Canvas including consultation protocols, recorded guided consultations, and topical knowledge related to English communication skills. The classrooms of 2050 will include diverse and a unique blend of learners. In order to prepare teachers and school districts to accommodate a wide ranges of learners, which would include the implementation of Dual Language programs. These presenters have researched and developed a Combined Dual Language Framework that works. Digital multimodal writing offers rich opportunities for learners to deploy multiple resources to make meaning, construct knowledge, and express self-identity. This presenter will discuss varied ways to implement multimodal writing in ESL classes. The presentation will highlight effective use of multiple technology tools, and provide pedagogical recommendation. Do you think successful collaborative writing is possible? This presentation illustrates several successful collaboration requirements to avoid failure in online collaborative writing projects. It shows how it is important in collaborative writing projects to consider task design, participants’ readiness for collaboration, and the way collaboration will be organized and delegated. During this InterSection, a panel of experts from CALL, AEIS and V-PLN will explore the concept of Blended Learning by first looking at its origin and then explaining best practices in multiple adult education settings. V-PLN will put a capstone on the presentation with short video clips of students giving testimonials of how this new concept has affected their learning. The use of social media to develop digital literacy among English learners is increasingly prevalent in TESOL. As learners' interest in exploring Instagram grows, the presenter will share three techniques of using Instagram in ESL/EFL teaching and discuss future possibilities of using Instagram in language teaching. Use of technology in language classroom is an absolute necessity to develop all four skills of English language proficiency. The presenter discusses the challenges of teaching and acquiring Functional Language Proficiency (FLP) in rural India and shares creative ways of using low-cost technology embedded in inexpensive mobile devices. Augmented Reality an option to teach EFL, in special to Hearing-impaired students. Venezuela`s education system, is promoting students` inclusion to students with different disabilities in the universities, and english teachers are searching strategies to teach them.This research will show how Augmented reality can help to teach EFL, but specially grammar, reading and writing skills to hearing impaired students, in spanish and english. This study provides the findings of the perceptions/beliefs of the pre-service ELL teachers regarding using the Game-based learning in their classroom. Leave the flashcards behind! Making vocabulary pages with Adobe Spark provides students with meaningful contexts and methods for vocabulary acquisition, a useful benefit in both ESP and content-based classes. Participants will learn how to use both the app and computer versions to create pages and practice making their own. The purpose of this presentation is to demonstrate how a free, innovative, and easy-to-use storytelling technology can be employed in the ESL classroom to increase students’ motivation for reading, engage their creativity, and provide ample opportunities for them to apply a variety of language skills on a storytelling project. Discover the U.S. Department of State's free e-learning events for EFL educators! With TESOL experts, we explore innovative, practical, student-centered techniques grounded in current theory and research. Digital attendees exchange ideas with colleagues around the world and earn digital badges. If you've participated, please stop by and share your experiences! The presenters will demonstrate how teacher and student-generated Audacity files can enhance integrated skills activities and at the same time encourage collaboration both in the classroom and online. Participants will see how this app can contribute to enriching language development and student engagement in a blended learning environment. Speaking and pronunciation teachers wanting to further their students' speaking time have a solution in Extempore, an all-in-one LMS and file storage system for audio and video responses. Extend your feedback beyond the classroom by sending assignments and feedback anywhere and anytime directly to your students' phone apps or computers. CircaLab's Spelling is a free application that works on all browsers and devices, requires no setup, and adapts to the user's skill level. The software is designed specifically for ESOL students and generates a report after each session. It combines listening and reading practice in a compact, game-like setting. It is useful for individuals or teachers and appeals to anyone from academically-oriented teenagers to adult refugee learners. Teaching academic English is more than just teaching grammar plus academic words. In this session, the presenters will introduce five useful e-tools and demonstrate how to use them to teach academic English lexically. Want a fun way to get your class involved in review? How about a Kahoot? Kahoot allows for the creation of fun competitive review games that students play using their devices. These games can be used for review or even as a form of formative assessment. Kahoot allows for visual input as well as text, so it works for learners of any level. Participants of this session will learn how to use Kahoot and create interactive games. Suggestions will also be provided for how to incorporate the game you’re your classroom. Bring your device and be ready to play. Learning2Gether is a wiki / podcast where teachers have organized almost 400 free online professional development webinars since 2010. F2f delegates in the EV can interact with online participants in a live Learning2gether episode to learn how Learning2Gether came about, sustains itself, and how it models peer-to-peer informal lifelong learning. PC 5 Modeling of information and communication technologies to integrate STEM and ESL/English literacy: G Suite for education. Linking a socio-cognitive process intervention approach to both STEM and non-STEM disciplines is not how students usually learn. This presentation bridges this gap and demonstrates socio-cognitive technology, such as Google Suite for K-20 Education, implying strategic growth at classroom and policy levels for an increased number of people. Knudge.me is a mobile learning application that can help language learners build their vocabulary including idioms, synonyms and homonyms. This demonstration will show how this interactive platform can teach vocabulary through gamification and infographics. Participants will be shown how to use the mobile app to strengthen their students vocabulary. Quizzizz is a free assessment tool for teachers that can help them assess their students using gamification. There are hundreds of available quizzes that can be used or customized to suit your students needs. Participants will be shown how to sign up as teachers and create quizzes for their students. The award-winning CLIO app is a free historical marker resource in many towns and cities in the U.S., providing opportunities for students to physically explore and learn about their environments. This session demonstrates one use of CLIO to create student group projects ending in oral presentations and poster sessions. The Airbnb app (a marketplace for travelers and hosts) can be used to collect authentic language for persuasion and positive/negative feedback. The presenter will demonstrate use of this free Apple and Android app to locate, harvest, and share language chunks within a TLBT lesson for intermediate+ IEP/EFL/ELF classrooms. This demonstration will show how the Flipgrid app, a video discussion platform, can be used for reading, speaking and listening practice with ESL learners outside of the classroom. The presenters will show how to use this free, easy-to-use app and how to provide formative video feedback. This demonstration will show how the WeChat app, a popular smartphone-based social media application, can be used for English learning. The presenter will cover how to use this free, easy-to-use app to take various exercises and how this app can be used for English classes. This demo illustrates the use of two related Android-based apps: English Pronunciation and English Conversation. Practice on vowel and consonant sounds as well as intonation is done by listening and self-recording. Through voice recognition and a 5-star system, the app gives feedback on accuracy. This presentation will demonstrate how teachers without having special IT knowledge can create Telegram bots to assess student learning. The attendees will learn how Telegram bots can help manage placement, unit and progress tests, assess reading, listening and writing skills, as well as grammar and lexis systems. We will briefly review some basic uses of Google G-Suite apps (Docs, Sheets, Forms, and Slides) and go deeper into third-party add-ons to enhance their use for facilitating projects, grading, evaluation, and feedback, with a focus on integrating them with specific student learning outcomes. The presentation demonstrates how learners can use mind-mapping software to enhance their reading comprehension, deepen their interaction, and evoke non-linear thinking. Participants will acquire ideas on how to utilize digital graphic organizers to depict a visual understanding of the main ideas and sub-ideas in a written discourse. Textbooks are expensive, so students are often reluctant to buy them, sharing the book or skipping assigned homework altogether. In this presentation I will share how I used, modified, and shared free electronic Open Educational Resources/books (OERs) for ESL Writing. We will discuss the benefits and limitations of this practice. Using my personal website as an example, wynnword.com, I will present and take questions on challenges and obstacles to creating your own website and touch on topics such as domain name purchase, a comparison of low, mid, and high-quality website design programs, page hierarchy, and design tips. The mini-workshop demonstrates a project in which pre-service teachers learned to create online asynchronous activities. Students practiced presentational strategies for online teaching, recorded slideshows and webcam with Screencast, added questions onto their videos using EdPuzzle, and interacted with their peers’ videos to provide feedback and reflect on their experience. This presentation demonstrates tools and assignments implemented in a blended ESL pedagogy course. Participants will see how a Learning Management System (LMS) and Google Apps can help deliver engaging content and develop pre-service teachers’ technological proficiency through use of discussion boards, videos, collaborative projects, and development of a teaching website. The presentation demonstrates how to carry out a pronunciation project based on suprasegmentals by using Flipgrid, a free video-discussion platform. Participants will have the chance to walk through the stages of the project and discuss other applications of this useful platform. This technology fair session will demonstrate how to use Socrative for paraphrasing practice in ESL writing classes. Socrative is a free educational platform that teachers can use to create learning activities. Paraphrasing strategies and examples of paraphrasing activities used in writing classes will be shown. This demonstration will show how the free application Mindmup can be used to create interactive graphic organizers to help students plan academic essays. We will also explore sharing and commenting features that allow teachers to provide detailed interactive feedback throughout the planning process, leading to more productive conferencing. Kahoot is an engaging online platform that can be utilized to practice many different language forms. Generally, instructors create Kahoot games, but when students develop the games themselves, they benefit in additional ways. This session provides insights on these benefits and also explains two different methods for incorporating student-generated Kahoots. The presentation demonstrates how students engage in real-life tasks and peer feedback via Linoit, a free online collaboration tool. The key features of task scenarios will be addressed via Linoit activities that promote meaningful interactions, critical thinking skills, and diverse learning outcomes for attendees to apply in their teaching context. Ensuring your course is accessible to all students is important for all instructors, especially when using a learning management system (LMS) such as Canvas or Blackboard. Ally is an LMS tool that can assist instructors by doing things like check accessibility, make recommendations and provide alternate formats for documents. The traditional approach that places overemphasis on alphabetic writing fosters narrow discursive modality and fails to promote rhetorical awareness and adequately prepare students for the complex dynamics of communication in an increasingly digital environment. My graduate study project looks into integrating multimodality in L2 writing class to promote rhetorical knowledge. This session presents my findings on the effectiveness of teaching metacognitive online reading strategies to improve comprehension of adult immigrant students. The tools I integrated into class were metacognitive online reading tools, computer-based texts and glosses, e-book system, and multi-media literacy software that educators can adapt to their teaching contexts. This qualitative method study investigated Chinese WeChat users' perceptions of WeChat add-ons in English learning progress through data collected from survey responses and individual interviews. An overview of the survey results will be discussed as well as a summary of excerpts from the interviews. Advances in technology provide authentic and high variability input for listening teaching. Based on the three pillars of listening teaching (i.e., segmental, suprasegmental, and connected speech features), this session introduces technological resources and demonstrates how participants can integrate these easy-to-use tools in their classrooms. This workshop demonstrates how to use a free online design software to empower students to create 3D objects. Participants will be guided step-by-step through the 3D design process, acquire practical ideas for how to use 3D design and printing in the classroom, and make their own 3D TESOL 2019 design. Participating in a CALL-supported Toastmasters demo meeting, Electronic Village presenters and conferees in Atlanta incorporate TESOL educators and ELT learners around the globe in an online Toastmasters club meeting, introducing a new technology application, the online Toastmasters International Pathways learning platform to enhance public speaking and leadership skill development. English teachers should either be banned with smart phones or learn to incorporate them in EFL classroom. We have discovered that ignoring their use doesn't help learning. If we incorporate the inside features of smart phones over the classroom teaching, could help to rectify their affection towards smart technology. Presenters will demonstrate three fun and funny vocabulary games via three mobile apps (Socrative, Quizlet, and Kahoot) and ask participants to take sample quizzes. Then they will ask them to comment on similarities and differences as well as suitability for different levels, skills, and content areas of ESP. This presentation will demonstrate how to use QR codes to create an “Amazing Race” activity designed to promote TESOL’s principles for exemplary teaching of English learners and to engage students in a fast paced series of tasks that practice listening, speaking, and reading skills through the use of hand-held technology. The presenter reviews online resources for EAP classes focused on preparing students for the tasks of academic reading. The presentation includes a review of websites, including Newsela, Readtheory, and Readworks as well as possible projects for teachers to implement. Oral communication skills present huge challenges to learners in EFL contexts. However, teachers can support their learners by assigning them engaging projects to leverage their interest and motivation. This demonstration highlights 4 video-oriented projects that can boost EFL learners’ speaking and listening proficiency. The presentation demonstrates how a multimodal asynchronous computer-mediated tool called VoiceThread (VT) can be used to promote L2 students’ multimodal literacy skills and oral proficiency development through digital-storytelling. Attendees will learn ideas and strategies for utilizing VT to develop interactive digital-storytelling in ESL contexts and see student samples of digital-storytelling. The purpose of this presentation is to show Flippity as an educational tool that helps improve the language learner’s pronunciation. The presenters will demonstrate attendees how English students employ Flippity to play while they learn the pronunciation of English in a flipping learning environment. Through screencasts, teachers are able to observe student progress and provide oral feedback to students preparing for presentations. The most valuable aspect of this feedback is that it is oral. Screencasts allow students to use listening and speaking skills to prepare for a presentation rather than relying on written feedback. Padlet allows teachers to create pages that resemble real mini-bulletin boards. This webtool (and its corresponding app) has the peculiarity of allowing users to collaborate and share resources, such as text, pictures, audio or videos, making it an ideal tool to use in the language classroom.